Metro CEO Phil Washington at the kickoff event Monday morning. Photo by Luis Inzunza/Metro. 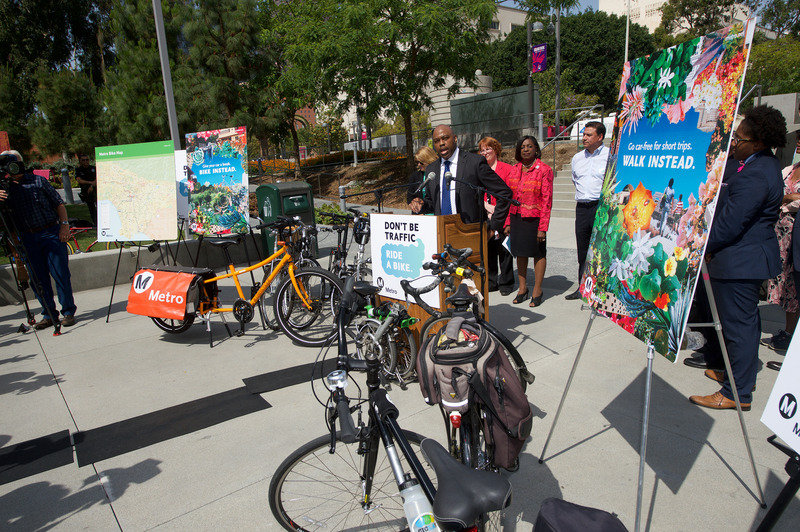 To commemorate Bike Week L.A. May 10-16, Metro today announced key new bicycle initiatives designed to help more Angelenos make the transition from “Bike Week” to “Bike Life” in L.A. County. In the works are a new bicycle campaign, new bicycle safety classes, bike sharing, bike hubs, triple bike racks on buses, Open Streets events and a spate of new Metro Board-approved bicycle-related policies that will add new spokes to the wheel of L.A.’s better mobility, helping the region gain increasing momentum in its adoption of bicycling as an affordable, emission-free and sustainable mode of personal transportation. New bike campaign ad for Metro’s Active Transportation Program. •First among these new initiatives, Metro has launched a new bicycle and walking campaign to encourage Angelenos to make more “active” trips rather than depending on their cars for every trip. Statistics show that nearly 50 percent of all trips are shorter than three miles. Forty percent are shorter than two miles, and 28 percent are shorter than one mile. These distances are ideal for bicycling or walking. New campaign ads, titled “Bike Instead” and “Walk Instead,” will appear on billboards and the backs of 264 Metro buses, as well as run on the radio through August of this year. •To help people share the road safely with automobiles on local streets, Metro also announces that it has received a $224,000 grant from the California Office of Traffic Safety to fund more than 150 bicycle safety education classes in L.A. County. More than 3,200 county residents of varying urban cycling skills and abilities will be able to take advantage of these free classes. Classes will be held in Los Angeles, Culver City, Santa Monica and Long Beach and will teach bike safety skills as well as practice on-road riding. Each participant will receive a helmet, bicycle light and safety manual for completing the course. •Bicycle safety classes will be valuable to Angelenos who may want to share a bicycle for short trips in downtown Los Angeles and other locales in the near future. Next month, Metro anticipates selecting a vendor for a Metro Countywide Bikeshare Pilot in Downtown L.A. including approximately 1,090 bicycles and 65 bikeshare stations opening in Spring 2016. Bikesharing is designed for point-to-point short trips using a for-rent fleet of bicycles strategically located at docking stations within a defined area that are easily accessible to each other. The pilot will test the feasibility of the program that could potentially be expanded to other communities. •For those bicyclists who want to ride their own bikes and connect with transit, Metro is now phasing in triple bicycle racks on its new 40-foot transit buses. So far, Metro has installed approximately 100 new triple bike racks on Metro’s New Flyer 40-foot buses. The agency plans to phase in these extra capacity racks on all future 40-foot bus procurements. By 2018, approximately 1,000 buses out of Metro’s 2,200 bus fleet will be outfitted with triple bike racks. Last year, Metro championed legislation to successfully change the California Vehicle Code to enable triple racks on 40-foot buses statewide in part based on requests from L.A. County’s bicycle community. •Cyclists seeking to store their bicycles securely at major transit hubs without bringing them on Metro buses or trains will also benefit from new planned Metro “Bike Hubs.” These are securely accessed, high-capacity bicycle parking facilities that include controlled access doors, tiered level bike racks and closed circuit TV cameras to monitor bicycles. Metro’s very first Bike hub is now under construction at El Monte Station, the largest bus facility West of Chicago. It will contain 56 spaces to store bikes and is scheduled to open in late summer of this year. Other Bike Hubs are planned at Hollywood/Vine Red Line Station which is scheduled to open in late 2015, and the Culver City Expo Line Station which is scheduled to open in mid 2016. Additionally, a North Hollywood Red/Orange Line Station Bike Hub and Union Station Bike Hub are now in the early development stages. •For bicyclists and others who want to take over L.A. area streets for a fun-filled “car-free” day, Metro is providing $2 million per year to fund CicLAvia-type “Open Streets” events in new cities. The next Metro-funded event organized by CicLAvia will be held in Pasadena on Sunday, May 31. Metro’s new policy initiatives, including its Sustainability, Complete Streets, First Mile/Last Mile Strategic Plan, as well as its Active Transportation Strategic Plan now in progress, will all help guide L.A. County toward a more bike-friendly future. Sustainability. Metro’s Sustainability Planning Policy for the first time defines sustainability for Metro and directs actions to incorporate sustainability in all aspects of Metro planning, programming and project delivery. The main goals of the policy are to better connect people and places, create community value, and conserve resources. The plan specifically calls for the development of Metro’s Complete Streets Policy and First Mile/Last Mile Strategic Plan. Complete Streets. Metro’s Complete Streets Policy is designed to help plan a better street environment for all types of users, including bicyclists, pedestrians, public transit, motorists and others. The policy explores specific ways to increase access for all users by making streets more “complete.” It also promotes local partnerships and incentive programs. Metro’s policy has been recognized as one of the top 10 policies in the nation by the National Complete Streets Coalition. Active Transportation. Metro is currently developing an Active Transportation Strategic Plan that will identify strategies to improve and expand the active transportation network within the county and improve access to the region’s burgeoning transit network. Part of the implementation of the Complete Streets Policy, the plan will explore ways to expedite implementation of local active transportation projects that have regional benefits as well as identify local, state and federal funding opportunities. First Mile/Last Mile. Upon full implementation of the Measure R sales tax approved by voters in 2008, two-thirds of county residents will be within bicycling distance of Metro’s Rail and Bus Rapid Transit system. The First Mile/Last Mile Strategic Plan, adopted by the Metro Board in April 2014, provides a planning approach to understanding the barriers transit customers face when getting to and from transit stations. Bicycling is a primary transportation mode under consideration for improvements in the plan. Metro is now working with cities to find opportunities for implementation of first mile/last mile solutions. Metro is taking an expending leadership role in filling in the gaps in needed bicycle infrastructure. The agency is helping facilitate coordination among multiple city jurisdictions to both implement new bike-related policy initiatives and to help solve large infrastructure challenges that no one single jurisdiction could address alone. The Rail to River and L.A. River Gap Closure project is a prime example. Metro is now conducting an environmental report to implement a bike path project on Metro right-of-way along the Slauson corridor from South L.A. to Inglewood. Metro is also conducting a feasibility study for an in-channel design bike path to connect an eight-mile gap along the L.A. River. Overall, Metro plays an critical role in bicycle planning throughout L.A. County, funding more than $200 million in bicycle projects since 1993. Our Bike Week speaker panel discussion: Is bicycling in your future? If Metro wants more people to bike, build more bike lanes, full stop. Not sharrows, not campaigns, bike lanes, cycle tracks, and bike paths. We hope that Metro is not throwing all of their eggs into one basket with their promotion of ‘bike share’ programs. Remember that commuters who use public transportation still want to have a choice in ‘modes’ of transporting themselves around the city. A certain portion are not fully supportive of giving up their own bicycles to use a ‘bike share’ bicycle. In light of this, with the purchase of 78 new rail cars, we would hope that Metro is incorporating a design that is not based on moving in reverse (having a rail car with only two bicycle stalls) relative to todays emerging bicycle culture, but moving forward. What does “forward thinking” look like in terms of a rail car? One possibility might be to have the ability to convert a passenger rail car to a ‘bikecar’ or partial ‘bikecar’ — without compromising safety (structural integrity) of the rail car. Learn more on our site under the PowerPoint titled “what is a bikecar?”. Most countries in the world that have excellent mass transit actually discourage bringing aboard full bicycles onto mass transit. All it does is take up precious space that other wise can fit more passengers. 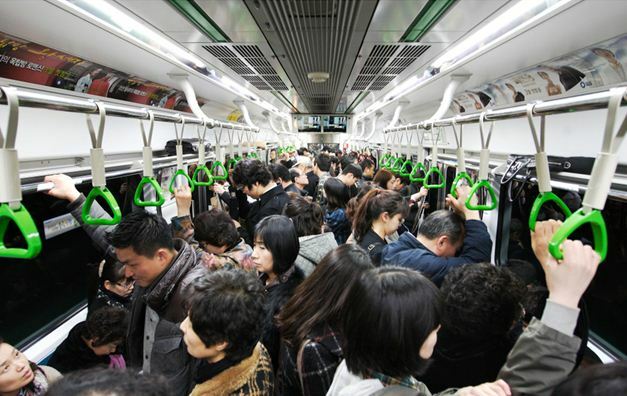 And if one were to bring aboard a bicycle onboard crowded trains like ones in Seoul or Beijing, you’d be looked at as selfish and inconsiderate. Metro recently reported that their ridership numbers fell by 4% and they are scratching their heads why. Yet they fund bicycle lane projects and even give away $2 million of our taxpayer money out of their stretched budget to CicLAvia events. Has the thought ever occurred that you guys are actually funding your own competition and that some of your ridership market is being taken away to bicycles instead? It’s so strange that Metro states on the PowerPoint presentation that “ridership is a major factor in achieving revenue projections” yet at the same time, they’re actually funding bicycle projects that may end up taking away some of that ridership. Perhaps it’s another scheme by government bureaucrats that they intentionally want ridership to decrease, get less revenue, and ask taxpayers for more money?